For using the 128 and 64 Otto Tuners with bones and ligament, hold the forks by the stem and gently tap them on your knee. With the finger or thumb of your free hand locate the spot on the body where you want to place the tuning fork. 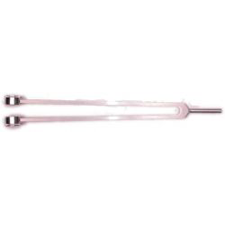 Press the end of the stem of the tuning fork onto the spot. Make a firm contact and hold the tuning fork until you feel the vibrations stop. For listening, hold the 128 Otto Tuner by the stem and gently tap the weights on your knees or tapping pad. Bring the tuning fork(s) to your ears and adjust the distance by tone. Hold one fork about an inch from your left ear and one an inch from to the right ear. This creates a long sustained pitch. This works well with the 128 Otto. The 64 and 32 Ottos may also be used in this manner. When tapping the 64 Otto and 32 Otto, gently tap the body (the weighted portion) of the tuning fork on your palm. This will set the weights in motion and create a pure tone. The 32 Otto is especially effective for stimulating nerves on the skin and hair. Tap it by the body as described and than lightly touch your skin or hair with the edge of the tuning fork body. You will fell it stimulate, vibrate, and “tug” at your skin and hair. You can also tap the fork and move it very slowly across an area just above your skin without touching.